Over on the MLL’s website there is an article/interview with Mark Millon, the 42 year old former super star who was recently taken #1 overall in the Supplemental Draft by the Rochester Rattlers (Oops, thanks Longstick33!). We learn a little bit about why Millon wants to make a comeback (partly for his kids), what role he thinks he will play (not an MVP role), and if he thinks the game has changed (he doesn’t think it has), but learn almost nothing about Millon’s abilities on the field. I know that he was capable of just about anything in his prime, and I know that Gary Gait was sniping Gs at this age in the pros not long ago. I also know that John Tavares is still sniping Gs in the NLL, and he is as old as Millon, so it’s not out of the question that MM could be back in a major way. But I want to hear Millon say something about it himself! He played the MLL interview humbly, but no one comes back to the MLL just to be a role player. I guess we’ll just have to wait and see on that one! Long Island = New York = Seattle? Update: It’s official. Neon New York Lizards Lacrosse is here! LPG is reporting that they are likely to rename the team the New York Lizards, and add in a neon green element to their logos and, most likely, their uniforms. 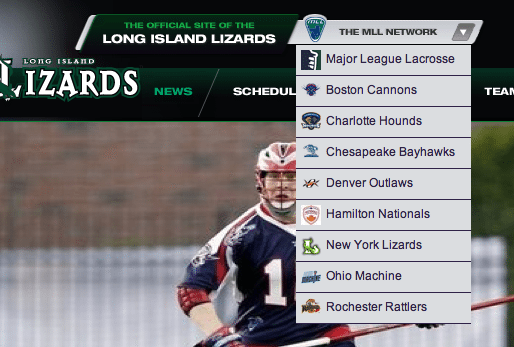 All we have to go on right now is a drop down on Lizardslacrosse.com, which shows the new name and colors. Also, Jack Reid is featured because Long Island/New York traded for him. It’s like I don’t even recognize NLL rosters anymore. So many new faces, trades and deals going down, it’s hard to keep it all in line. However, the Paul Rabil, Jordan Hall, Joel White, and Rob Campbell to Philly, and Paul and Dan Dawson to Rochester trade stands out in a major way. Is Rabil even playing this year? I guess we’ll find out soon! Either way, Philly picked up FOUR transition players in the deal, and dealt away a forward and a defender. With a heavily American offensive core (and Kevin Crowley), it is going to be especially interesting to see how they fare this season. It’s good to see pro box lacrosse back in Montreal, even if it is only for one scrimmage. The Toronto Rock are set to play Rochester at the Bell Center on December 15th. With lots of guys still trying to wrap up a spot, it should be a spirited scrimmage, to say the least.